Our office chairs are available in various fabric and color choices. We offer a complete line of chairs chairs that can be matched to a variety of desks and conference tables. Free shipping on all office chairs! We feel the most important purchase of any office furniture are office chairs. Discount Office Furniture 4 U offers office seating that has been reviewed for both quality and comfort. 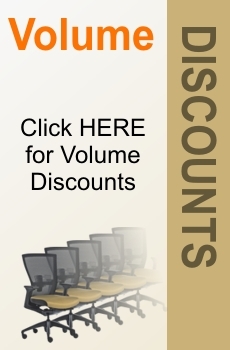 Choose from a variety of ergonomic task chairs, executive chairs, conference chairs and guest chairs, at discounted prices.